I got my hair colored for free on Tuesday as part of the Bumble & Bumble University Model Project. It’s such a great deal. They do a wonderful job and it’s free free free!! I’m going back next Friday for a free styling session and to get this product put in my hair that makes the color last longer. I took the picture on the left just now. I’m still a little damp from swimming and showering. It looks so much lighter than the picture on the right, which I took as soon as I got home from having my hair colored. The one on the right is closer to what it really looks like. It’s a dark medium brown. They also informed me that my skin tone was “medium.” I’ve always thought of myself as having olive skin in color, but fair. I’m not fair-skinned they told me and I also don’t have olive skin. They also said at first that my eyes are hazel, but they’re brown. A medium brown. They took another look and agreed with me. Like the color. Looks really good on you. One thing I wouldn’t give up when I went through my period of unemployment in 2009 was coloring my hair. 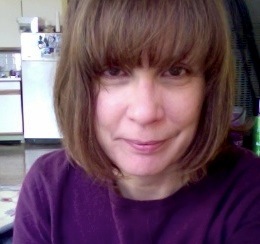 Mind you, I have no gray or white strands (I’m 56 and my father’s side of the family never really and truly went gray when they became old). But it is a not-so-attractive shade of mousy brown. 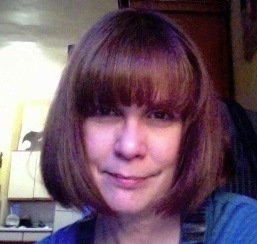 So, every six weeks off to the stylist to have it colored a light auburn. Takes years off – most people think I’m in my early 40’s. Money well spent when you’re back out in the job market with all them young-uns. I think its why our generation looks so much younger than our parents or grandparents did at the same age; it’s because we all color our hair. Karen, how often do you touch up your color? I get the roots done (by my stylist) every six weeks. I’ve never been able to get the color right on my own as red is such a difficult color to maintain; it fades quickly even though I use a color specific shampoo, only shampoo every other day, etc. Something about the color molecule being too big to really infiltrate the hair well. I would think your color might go a little longer than mine. I do it that often because of the color fade and not because the roots are all that noticable. I only shampoo once a week! I know this sounds insane, but for the rest of the week when I go into the shower I wet my hair and put conditioner in only, and rinse that out at the end of the shower. You’d think my hair would get greasy and limp by the end of the week, but it doesn’t.